With his good-looking entourage (especially one of his campaign bodyguards), newly-elected president Moon Jae-in has excited many in South Korea and beyond. Now, he is enthralling the electorate with his choice of ministerial nominees – this time, not for their appearances but because they are women in positions previously dominated by men. So far, Moon has nominated three women for top government posts, each dubbed a “first” for her respective position. And this trio looks likely to be joined by more fellow female nominees. On May 11, just a day after being sworn in, Moon set the tone by appointing the first female senior secretary for personnel affairs. Cho Hyun-ock, a visiting professor at Ewha Womans University, is the first woman to occupy the position. Technically, it was occupied by another woman during the progressive Roh Moo-hyun government — when Moon was chief of staff — but she only covered a three-month gap before the new government came along, instead of being appointed at the dawn of the administration. During Moon’s campaign, Cho worked as deputy chief of his gender equality team. A few days later, on May 17, Moon broke yet another tradition by announcing the first-ever female minister of patriots and veterans affairs. After her appointment, Pi Woo-jin, a retired army lieutenant colonel and one of the first female helicopter pilots in South Korea, made headlines for her history of relentlessly battling for women’s rights in a male-dominated environment. In 1988, as a captain, Pi reportedly declined a request to send female soldiers to a senior officers’ drinking session, with a special instruction to have them “dress nicely, not in uniform.” As her seniors wouldn’t take no for an answer, Pi unwillingly sent the women but dressed in combat uniforms, she said in an interview with Shindonga magazine. Nominees’ ethical qualities are often questioned during such hearings, which may explain why senior personnel affairs secretary Cho has already revealed in a public announcement that Kang’s daughter has U.S. citizenship (as opposed to having a Korean citizenship) and once registered under a false address a few years ago to attend her preferred school. Former president Park Geun-hye, despite being South Korea’s first female leader, only appointed two female ministers upon inauguration. 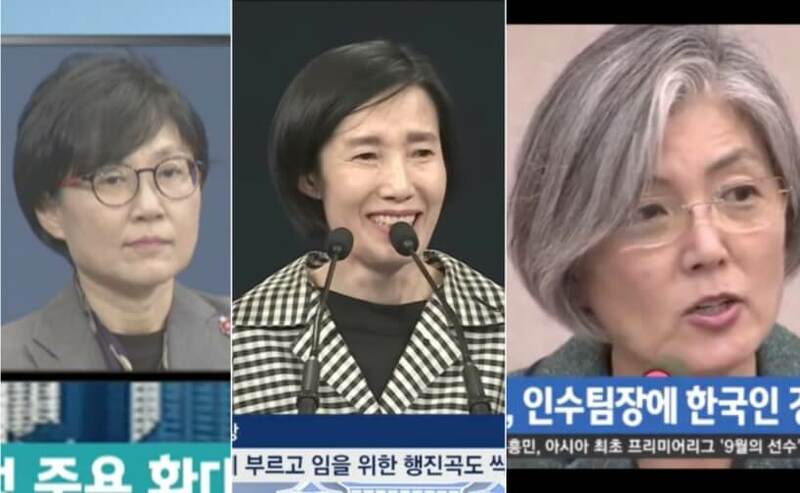 No woman occupied a senior position in Park’s secretariat, a situation considered to have undermined gender equality in the South Korean political sphere. And in her cabinet, minister of maritime affairs, oceans and fisheries Yoon Jin-sook raised eyebrows even among Park’s Saenuri Party members during her confirmation hearing due to her clear unsuitability for the position. Yoon passed the hearing nonetheless, only to be let go within a year in an attempt by Park to shake up her cabinet. Park’s only other female minister, Cho Yoon-sun, is now in custody for drawing up a blacklist of artists critical of the former administration. Cho began under Park as minister of gender equality and family (whose predecessors had all been women – understandably, given the ministry’s aim) before going on to become minister of culture, sports and tourism. She then achieved the ignominious feat of being the first minister in active service to be arrested. When Park Geun-hye was elected as the nation’s first female head of state, many hoped she’d blaze a trail for gender equality. Instead, South Korea’s deplorable gender equality status only worsened in subsequent years. When it came to women in ministerial positions, the country ranked 128 out of 144 countries in the World Economic Forum’s 2016 Gender Gap Report, with a figure of just six percent. But now Moon is trying do better, trying to appoint more women to his cabinet than any of his predecessors. He vows to achieve gender equality within his cabinet before his term is over. Let’s see if he holds onto that promise when all the appointments and nominations have been made.